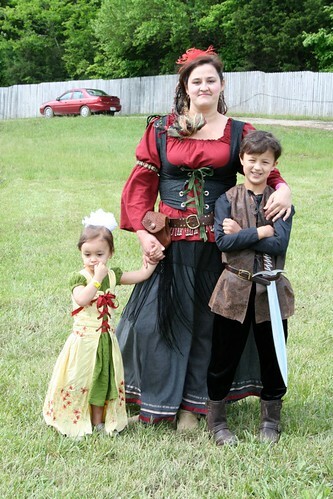 The Renaissance Wench: Renaissance costumes finally complete and in use!! Renaissance costumes finally complete and in use!! I posted some of these on my other blog, but I felt the need to post some costume related ones here. The full photostream is on Flickr and you can get to that by clicking here or on any of the photos below. Here is a full length shot of me and C & J. Ignore the stupid look on my face and Jack's completely skinny belt...I didnt catch the belt before we were half way across Nashville and the smart-assed look is a permanent feature. 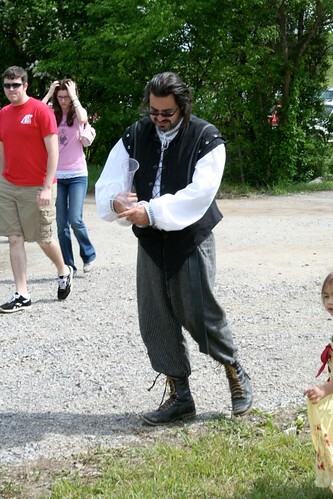 Here is full length Chris fighting some beer glasses. Here is a close up of Julia's lacings. And here is a full length of her and Jack. 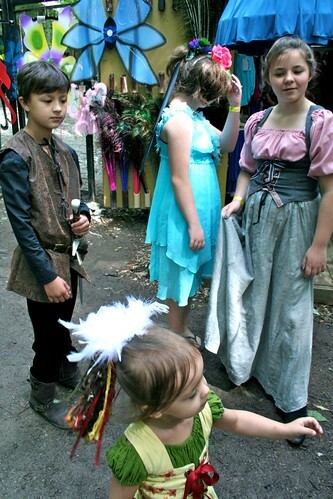 And, a good shot of Caris's hair fall...the feathers on top were just added to annoy her when she wasnt looking;-P. Also, the blue fairy Hope is wearing is a previous year's costume of Julia's. It is much loved by any girls that join us each year and has been worn by several of them who needed a costume in a pinch. So that is a good smattering of costume photos. Click on one of the pictures to see the full set--or on the link at the top. It was fun!! Come with us next time! !